The de Leon Prize in Neuroimaging recognizes a senior scientist and a new investigator (first authors) who are judged to have each published the best paper in any peer-reviewed journal related to the topic of in-vivo neuroimaging of a neurodegenerative process. 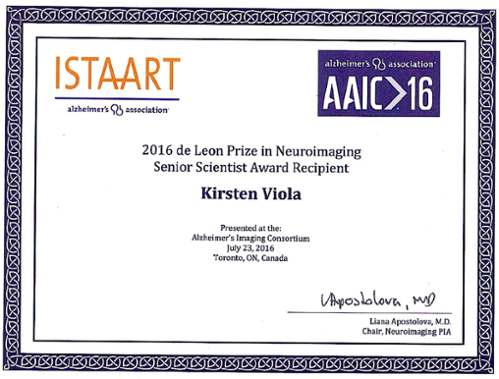 Members of the ISTAART Neuroimaging Professional Interest Area (NPIA) are the nominating body for the two awards. After graduating with a degree in genetics and developmental biology, Kirsten Viola stayed at her alma mater, Northwestern University, to join Dr. William L. Klein in research. Her earliest work focused on the study of Alzheimer's disease type phosphotau in CNS development. She soon included studies of APP and amyloid beta protein and their impact on cultured SH-SY5Y neuronal cells, showing first that Aβ exposure induced tau phosphorylation, FAK phosphorylation and neuronal loss. She went on to show by whole mount electron microscopy (WMTEM) that APP is released from cultured SH-SY5Y cells and binds in clusters on the substrate and at discrete microfilaments along processes. Viola was on the team that discovered that fibral-free Aβ oligomers (AβOs) are potent neurotoxins and developed a method to produce these oligomers without the use of chaperones such as ApoJ. Viola, with Mary Lambert, used these fibril-free AβO preparations to develop conformation sensitive, AβO-selective polyclonal and monoclonal antibodies that are now used by researchers around the world. After the development of these antibodies, she shifted her research focus to the usage of these antibodies to study the structure and function of AβOs. Viola used these antibodies to reveal that Aβ oligomers bind to neurons in a punctate manner, resembling ligands binding to their receptors. Later, with her colleagues, she demonstrated that synthetic AβOs and human brain-derived AβOs are similar and that AβOs target synapses. She contributed to studies showing that AβO binding impacts spine structure, induces ROS formation and is blocked by insulin. She also co-authored a review on the uses of conformationally specific antibodies in Alzheimer's research and therapy in 2009. Her recent work has largely focused on antibody-based therapeutic and diagnostic development. Kirsten and her colleagues revealed that AβOs can be detected by molecular MRI in Tg animal models in-vivo using a new, non-invasive brain imaging approach. Recently, she worked with William Klein to co-author a comprehensive review of AβOs in Alzheimer's disease pathogenesis and their use in developing effective diagnostic and therapeutic tools. Viola continues to focus her research on antibody-based therapeutic and diagnostic development, while concurrently continuing her investigation of the relationship between tau and AβOs that she began 25 years ago.